“That which does not kill us makes us stronger," Friedrich Nietzsche once famously said. What hasn’t killed the Republican Party in past years may indeed seal its fate this time, and one man will be to blame unless current GOP frontrunner Newt Gingrich follows a plan to rekindle the policies and platforms of former Republican president Richard Nixon. Gingrich is no doubt a political opportunist of the worst kind, but he must avoid dousing his party’s torch in 2012, by resurrecting a familiar and brilliant past candidate, Nixon. Gingrich’s task at hand is to reverse the negativity of this well-established biography in the same way Nixon did, and show voters that like Richard Nixon in 1968, he’s a changed man who will restore conservativism. It may be less difficult than it seems, especially when fellow GOP contenders hand him opportunities to defend himself, like Texas Governor Rick Perry did when he seemed to jab at his past marital indiscretions. The lack of any well-loved candidate in 2012 may be dictating Gingrich’s rise, a fact that places his aspirations perfectly on track with that of Nixon in 1968. After being convinced of a clear mandate by supporters when (ironically) George Romney’s candidacy deflated overnight, Nixon felt his time had come. The story, this time, has begun in much the same way: A familiar hatchet-man remembered for years of polarizing politics tries to soften his image; how it will end this time remains unclear. Those who remember what America felt like after six years of Nixon would be the first to confirm the dangers that arise when an “I’ve been around the block” type of Washington opportunist pops his head out of the ground. 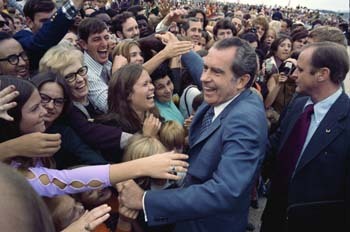 Gingrich would be wise to avoid the politically sterilizing association that association with Nixon conjures up.